I keep a wish list of rhododendrons I want, and at the moment, the species R. albrechtii is included in the top three of my list. I grew it in my old garden, but sadly, when I moved, it was one of the plants I had to leave behind. I haven't found a replacement plant for sale yet, but I keep looking, and after all, the hunt is almost as much fun as growing the plant. I may have to break down and order some seed of this species as it's not commonly available in the trade as established plants. Why do I like it so much? Well, in bloom it's such a sweetheart! 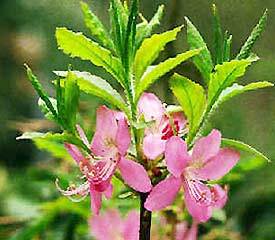 The plant I grew had deep cerise-pink flowers, two or three to a cluster, and each flower was almost 2 inches across in size. In doing a bit of internet searching, I see other growers report floral colours ranging from the deep rosy pinks into the purple reds, and up to 5 flowers per cluster. In the Pacific Northwest, R. albrechtii usually blooms in mid to late April. The plant, native to Japan, is a deciduous azalea, and the leaves on my "old" plant turned a lovely yellow before they dropped in the fall. I'm not sure if fall leaf colour is a constant for all albrechtii plants, but it's nice when it happens. I had my plant situated on the north side of the house, but it got good light from mid-afternoon on into the evening. It prefers areas with cooler summer temperatures, so avoid planting sites that receive hot temperatures and mid-day sun. The usual recommendation of even soil moisture applies. Plants grow to a height of about 4 feet, so R. albrechtii is a good choice for the small garden, or even a large container. It's also a good choice for woodland plantings. Do keep an eye out for this great little plant – it should be on everyone's wish list.